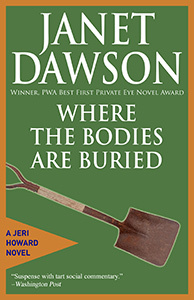 Do you know Where The Bodies Are Buried? Jeri is about to find out. Her client was murdered before he could tell her why he needed a private investigator. Jeri thinks the answer is at the company where he worked. So she polishes up her word processing skill, borrows a suit and goes undercover as a secretary. The phone rang at one in the morning. At least that’s what the faintly glowing red digits on my clock radio said. As the phone jangled, I struggled from the tangled embrace of sheets, dislodging my cat Abigail, who was curled up at the hollow of my back. As I groped for the switch on the bedside lamp, my other cat, Black Bart, jumped to the floor, as though to escape the hullabaloo. I picked up the telephone receiver, mercifully cutting the racket in mid-peal. I picked up on the past tense right away. You notice words like that, particularly when they’re used by a homicide detective.